Walking Desk or Stand Up Desk, Which Should You Use? Stand Up Desk or Walking Desk? Both stand up desks and walking desks are enjoying an explosion in popularity, especially in corporate America and SOHO (small office/home office) usage. The latest medical evidence shows that an hour of sitting is as detrimental to your health as smoking a cigarette, and both provide the same key benefit of reducing the hours you spend sitting. But that’s where most of the similarities end. While stand up desks and treadmill desks are terrific implements for the sedentary worker’s battle against sitting disease it’s actually the combination of the two that yields the best results. The majority of medical experts and scientists who study biomechanics and metabolism agree that standing is much better than sitting. From a common sense point of view we know that we evolved as a species to move in an upright position, not to sit in chairs in front of a computer screen for extended periods of time. Watching Animal Planet while sitting on the sofa is not the same thing as chasing down a rabbit for your dinner. There is vast evidence that important biological functions virtually shut down when we are idle, and that our caveman DNA takes over and tells the body to switch from “on the hunt” mode to “not on the hunt mode”. The result is, among other things, a drastically slowed metabolism and increased storage of fat. Numerous studies have come out that say standing desks lower the risk of metabolic syndrome and cardiovascular disease; they may even help with healthy hair¹. Moreover, when we sit we subject our bodies to ergonomically disastrous positions. Sitting places your back in a tenuous position where your back muscles and core are no longer supporting your upper body. This leads to back and neck strain, as well as repetitive strain injuries. When at a stand up desk, you move more. Your core and back muscles are engaged, and your legs, hips, and shoulders are no longer constrained in place by your chair. However, there are downsides even to standing that should be considered as well. There’s plenty of information on the web about the common afflictions of those who stand on their feet all day, like retail and factory workers who stand in a small area and rarely have time or space for movement. Too much standing, without enough movement (especially if spending many hours standing in high heels), can lead to varicose veins, deep-vein thrombosis, knee- and hip injuries, and blood pooling in the legs. There’s a variety of ways to alleviate the harmful effects of too much standing. The first is easy: don’t stand all day! Break up your standing and sitting times into manageable chunks throughout the day – most of us here don’t stand for more than two hours at a time, though you should listen to your body if it shows signs of fatigue. 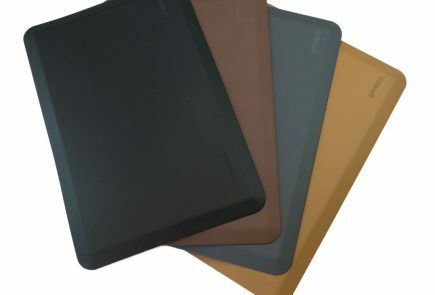 A quality anti fatigue standing mat, like the Experts’ Choice iMovR EcoLast Premium Standing Mat, provides comfort and support for your legs and feet, as can varying your leg positions with a foot rest. These office accessories can help prolong how much time you can comfortably spend on your feet. But static standing can only take you so far, and if you want a complete active workstation that mitigates the problems of standing all day, you’ll need a treadmill desk. Don’t Just Stand—Move With a Walking Desk! Anyone who has ever had to staff a trade-show booth knows that standing on your feet all day hurts a lot more than walking the aisles all day as an attendee. Walking slowly throughout the day boosts your energy level and productivity, soothes joints and muscles, and keeps your metabolism at a healthier level. Imagine this same difference but for every day of your working life—that’s the kind of world a treadmill desk affords you. The most common misconception about walking desks is that their only purpose is for weight loss. This is the unfortunate consequence of numerous book titles, articles and advertisements from treadmill desk manufacturers who focus too much on this aspect. Walking desks increase your body’s “non-exercise activity thermogenesis” (NEAT) – the small, active movements that accumulate throughout the day to boost your basal metabolic rate and maintains your body’s calorie-burning processes. The majority of treadmill desk users are fit, healthy people who want to stay fit and healthy, and who know that sitting in a chair all day will eventually lead to a slowing metabolism, higher cholesterol and triglycerides, higher blood pressure, weight gain, and in increasing incidence, Type II diabetes. Of course, working at a walking desk for too long carries some of its own drawbacks. Just as sitting or standing for too long isn’t good for you, neither is spending an 8-hour workday on a treadmill. The very best advice we can give is to switch up your position throughout the day. That’s why our favorite office setup here is a sit-stand-walk desk, where you can easily switch between sitting, standing, and walking, without interrupting your work flow. Sit when you must, walk when you can, and stand in between. If you spend roughly a third of your day in each of these three positions you will be optimizing your health. The good news for treadmill deskers is that merely stopping the motor will convert their workstation to a standing desk, a two-for-one deal.